This mirror, designed by Thomas Pheasant for Baker, is currently one of my favorite mirror. I really like the pentagons clustered around the convex mirror. They almost look like little bubbles coming out of the mirror. And on top of the pentagon clusters, blings are attached. These blings are like diamonds fracturing light. They definitely gives this mirror an extra "umph"! Loosely inspired by a kimono with cherry blossoms rendered in an Art Deco manner, Thomas Pheasant views the Blossom Mirror as one of those rare but riveting objects that finish a room. The mirror has a textured banding immediately around it. A much larger and more dramatic, but still somewhat organic, Bronze frame requires more than 100 welds to secure a sculpture consisting of five-sided flowers. A total of 18 crystal blossoms, in two sizes, are then positioned for dimensional effect. The resulting play of shadow, light, and prismatic rainbow rustles against the wall. 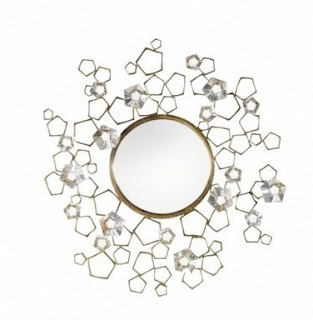 The mirror is convex, and the surrounding rim has an organic texture. Thomas Pheasant, based in Washington DC, started his interior design practice in 1980 so he definitely know how to design a thing or two. His interiors are what I would term clean American traditional interior. You will never get a stuffy grandma interior from him. His style tends to be light and airy. In 1997, he won the Andrew Martin International Designer of the year award which is the highest honor an interior designer can receive. In 2005, he was named as one of the American design dean by Architectural Digest. Look at the mirrors created by Line Vautrin in the 40s and 50s. This mirror, while beautiful, seems banal in comparison. Her metalwork cannot be matched (or in this case) imitated. Have not gotten to Line Vautrin yet. Her works are exquisite!